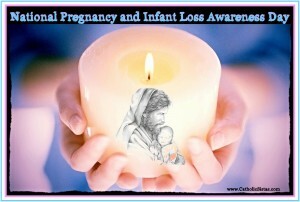 On this day, Pregnancy and Infant Loss Remembrance Day, we take time to remember our children who have died too soon. Whether you have experienced the loss of your child through miscarriage, stillbirth, or in those first few hours, days, or months of their short lives, the pain can often be overwhelming and unbearable at times while at other times you may simply feel numb to everything around you. Those feelings in the days and months following a loss will often change as more and more time passes. Yet, no matter how much time goes by and how much we “move on” with our lives, we never forget. Our child or children will always have a home in our hearts and we often find ourselves thinking about them and missing them at random times. Today, we at Catholic Sistas would like to share our stories of loss. Throughout today you will see a variety of different stories shared from our writers as well as a few of our friends. But we also want to hear your stories! If you have a blog, we encourage you to share your own story there and to link it up for us below in the link-up. Please also include a link in your story back to this post so that others can find us and read the various stories we will be sharing with each other. Thank you in advance for sharing your stories with us. We hope they will give support and encouragement to others. Gina - Linking up. I’m including the slideshow that includes the names of children lost submitted by families. Also linking (in the post) to my daugther, Myla’s, story. mrs dan - Our little Lucy Loretto left us in January 1992, the only time I’ve ever been pregnant, as far as I know.